416 pages | 19 B/W Illus. 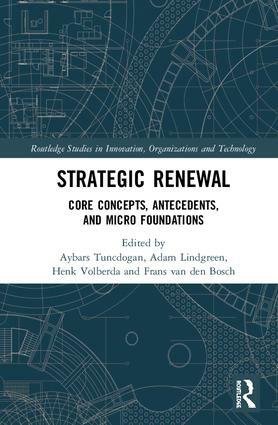 Strategic Renewal is an original research anthology offering insight into a subject area which, although critical for the sustained success of organizations, has received relatively little attention as distinct from the more general phenomenon of strategic change. Firstly, by providing a summary of the literature, this research anthology helps graduate students and new researchers grasp the current state of affairs in the field. Secondly, this research anthology will help update the knowledge base of the existing researchers in the field. By bringing together various studies, the research anthology determines the core concepts of the field and elucidates the key gaps and future research areas. Through contributions building on the knowledge bases of other disciplines, this research anthology develops an interdisciplinary research agenda, giving the reader an in-depth understanding of the mediating, moderating, and antecedent variables concerning strategic renewal. Strategic Renewal aims to provide a state-of-understanding to the subject, as well as a clear picture of the cross-disciplinary landscape that informs the subject. Thus, this research anthology is essential reading for managers, consultants, and other practitioners, as well as students and scholars of business. Aybars Tuncdogan is a lecturer (Assistant Professor) in Marketing at King’s Business School, King’s College London. He is a Fellow of the Higher Education Academy, a committee member of the British Academy of Management’s marketing group and an editorial review board member of Industrial Marketing Management. Dr Adam Lindgreen is Professor of Marketing at Copenhagen Business School where he heads the Department of Marketing. He also is Extra Ordinary Professor with University of Pretoria’s Gordon Institute of Business Science. Dr Lindgreen received his PhD from Cranfield University. He has published in the California Management Review, Journal of Business Ethics, Journal of Product and Innovation Management, Journal of the Academy of Marketing Science, and Journal of World Business, among others. Henk Volberda is Professor of Strategic Management & Business Policy and Director of Knowledge Transfer at Rotterdam School of Management, Erasmus University. Moreover, he is Scientific Director of the Erasmus Centre for Business Innovation. Frans van den Bosch is Emeritus Professor of management interfaces between organizations and environment at the Department of Strategic Management & Entrepreneurship, Rotterdam School of Management, Erasmus University.